The club has been organizing this special hospice tournament for quite a few years now and usually around $10.000.00 is being raised every year. The last tournament was held in November and last Monday the money for our local Totara hospice was presented by club president Des Redgwell to CEO Tina Mc Cafferty who is very new to the job. 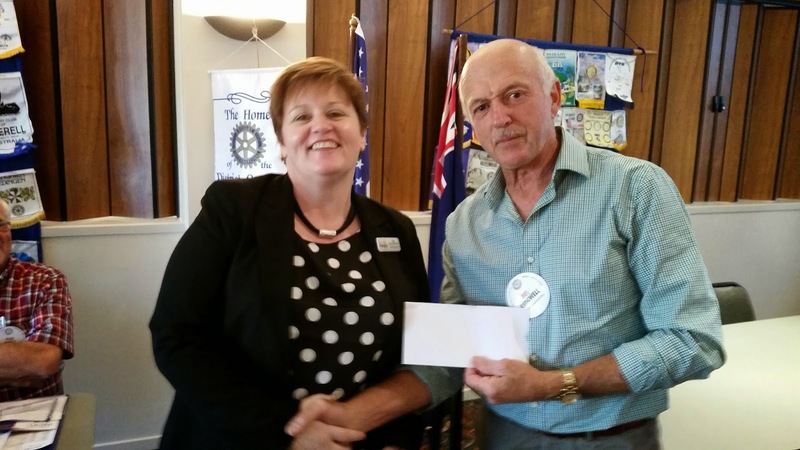 Tina thanked the club for the privilege of attending the meeting and acknowledged what community groups like Rotary do for the hospice. They receive 50% funding from Government but the other 50% is raised by hospice itself or groups such as Rotary. It takes a bit of organizing the yearly tournament but the Drury club members do it with great dedication and it is a pleasure to give this money to such a worthwhile cause. We couldn’t have done so well without the help of the local sponsors , we are very grateful for all the help received.